Marshon Lattimore had a outstanding performance Sunday evening. He was responsible for the early interception off of Nick Foles. Lattimore moved to shadow Alshon Jeffrey late in the game and did a great job on him. Lattimore also all but sealed off the victory with an interception off of a Jeffry drop. Although Cameron Jordan did not destroy the game for the Eagles, he was the best on the Saints’ front seven. Jordan was active batting down passes and used his bull-rush somewhat effectively. Jordan also had a positive impact in run defense for the Saints on the edge. Drew Brees, our highest-graded passer in the regular season, got off to a rocky start, under-throwing Ted Ginn on the opening play from scrimmage for an interception and just generally missing the mark in the opening quarter. He eventually settled in, and while he still had a few misses down the field, Brees was excellent to the intermediate area and on third downs. On the receiving end of most of those key Brees’ passes was Michael Thomas, who hauled in 12 passes for 171 yards and a score. Thomas continuously found the weak spots in Philadelphia zone coverage, converting seven of his receptions for either a first down or touchdown, three of which came on third down. Foles started the game off hot with a 37-yard touchdown on the first drive of the game. Foles then orchestrated a drive down to the Saints one-yard line, where he punched it in himself on a sneak. 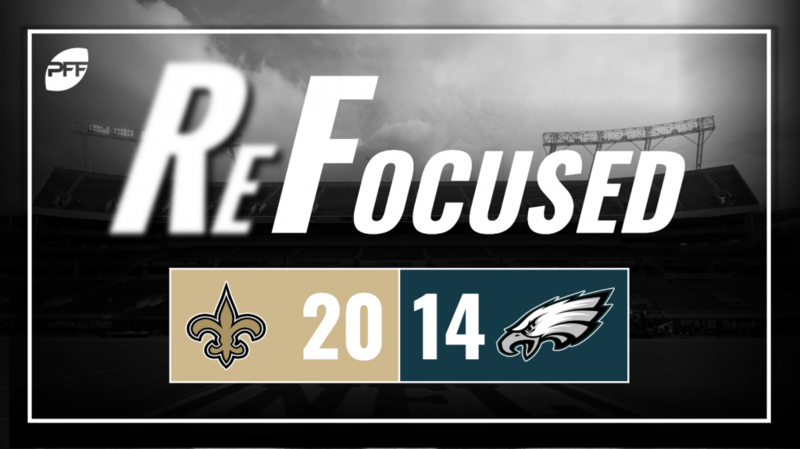 Foles and the Eagles’ offense struggled from there. Foles under threw a deep ball to Zach Ertz that was intercepted by Lattimore and also missed his fair share of throws after the opening quarter, which stalled many Eagles drives. The Eagles’ offensive line as a unit did a good job overall protecting Foles. Foles sat in a clean pocket on the vast majority of his throws. Although they were unable to run the ball effectively, they protected the quarterback well, which is much more valuable. Led by Michael Bennett, who had an excellent game, the Eagles’ defensive line controlled the trenches in the run game and, with the exception of a couple plays, kept Alvin Kamara and Mark Ingram bottled up around the line of scrimmage. Philadelphia’s second-level defenders had a rough time in coverage, routinely giving up dig and glance routes to Thomas & Co. in the intermediate area. Adding insult to injury, many of these throws came on third down, allowing the Saints to move the chains and control this game for the final three quarters. It wasn’t the cleanest performance of the season for Brees, but he made the throws needed in key situations to keep the Saints on the field and in control of this game.